Seriously, if anybody thought the massive criticism for her former singles were going to slow this girl down, the person must have made a mistake. Instead, she said it has made her more determined to pursue her dreams. Meanwhile, her singles were reported to have broken a record that no other Nigerian song has ever done. It recorded over 5.8 million downloads barely 48 hours after the online release has improved considerably in her songwriting ability and delivery. 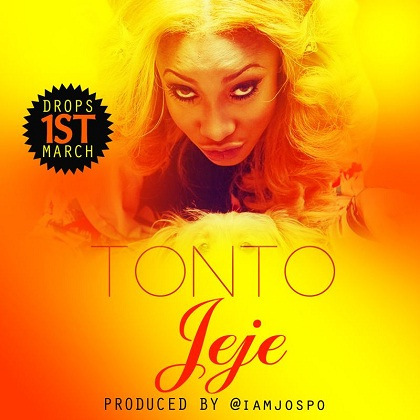 Tonto said she can’t really say what inspired her but all she knows is that music is her life.” I love music and I’m very passionate about a career in music. Jeje is just a tip of the iceberg from other great songs that I will be releasing in the nearest future”. She said the criticism her former singles generated has given her strong will and unlimited determination to do music, noting that she is prepared to succeed. “I don’t see myself quitting music because of criticisms or negative comments. Criticisms make one better as you don’t expect everyone to like what you are doing”.